The Monitoring Officer, Justice, Development and Peace Centre (JDPC), Mr. Abiodun Abacha Adebesin, has called on the International Monetary Fund (IMF), World Bank and Central Bank of Nigeria (CBN) to lead agitations for the insertion of Braille signs on currency notes, reports NaijaAgroNet. Braille, NaijaAgroNet gathered, is a tactile writing system used by people who are visually impaired and is traditionally written with embossed paper. NaijaAgroNet also gathered Braille users could read computer screens and other electronic supports thanks to refreshable braille displays available nowadays. 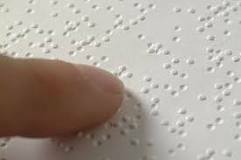 Making this call, Mr. Adebesin, noted that its high time global financial institutions consider adding Braille signs on our paper currencies in fulfillment of the one of the 2030 Sustainable Development Goals (SDGs) of not leaving any one behind. As said by Adebesin, the blinds have been cheated on so many occasions because they rely on people to determine the denominations of the money they are holding and this is really saddening. “If this done by all financial institutions in the world with the support of IMF and world bank, this will be in line with agenda 2030 'Leave no one behind'.